Benjamin and the Chargers have agreed to a one-year extension through 2020, with the wideout receiving a signing bonus in exchange for reducing his 2019 base salary, Field Yates of ESPN reports. Coach Anthony Lynn said Benjamin, Dylan Cantrell and Geremy Davis need to step up after the Chargers lost Tyrell Williams to the Raiders this offseason, Eric D. Williams of ESPN.com reports. Benjamin failed to corral either of his targets Sunday in the Chargers' 41-28 divisional-round loss to the Patriots. Benjamin caught all three of his targets for 11 yards in the 23-17 wild-card win over the Ravens on Sunday. Analysis: The Chargers opted to use Austin Ekeler as their primary jet sweep option, utilizing Benjamin more as a running decoy than anything else. There's a possibility Benjamin could see more than his 16 offensive snaps next week in an effort to implement more lateral movement against a suspect Patriots defense, but he still ranks far below the likes of Melvin Gordon, Keenan Allen, Antonio Gates and Mike Williams when it comes to potential receiving options. Benjamin finished the season with 12 receptions for 186 yards and a touchdown across 12 games. He also carried the ball seven times for 41 yards. 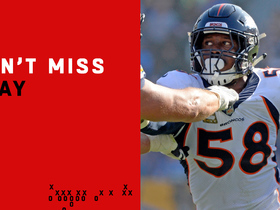 Analysis: In only six of his 12 outings did Benjamin play more than 20 offensive snaps, as the Chargers essentially deployed him primarily as a downfield decoy throughout the campaign. Injuries also limited Benjamin's role on special teams, with Desmond King emerging as the primary returner instead. With just one year remaining and a dead cap hit of $1.2 million left on the contract he signed in 2016, Benjamin is uncertain to remain with Los Angeles in 2019. Benjamin caught one of his three targets for 11 yards and also carried the ball once for six yards in the loss Saturday to the Ravens. Analysis: Keenan Allen dominated the targets among Chargers wide receivers Saturday, as Tyrell Williams, Mike Williams and Benjamin combined to catch three of eight targets for a measly 30 yards. Benjamin is very clearly the No. 4 or 5 option in terms of receivers when everyone is healthy, but his speed makes him arguably a more important real-life asset than fantasy. Benjamin caught two of his three targets for 57 yards and also registered one carry for eight yards in the 29-28 win over the Chiefs on Thursday. Analysis: Benjamin's two catches didn't come until the fourth quarter, but they were incredibly pivotal, as both wound up extending the eventual game-winning drive. Even with the likes of Keenan Allen (hip) out for much of the second half, Benjamin barely factored in the offense and remains a longshot in terms of fantasy relevance. Benjamin caught his lone reception for 11 yards in Sunday's 26-21 victory over the Bengals. Analysis: One week after snagging his first touchdown of the season, Benjamin promptly fell back down to earth, posting his fifth game this season with one or fewer catches. It's difficult to recommend starting Benjamin until he factors more into the offense given he's averaging 1.9 targets this season. Benjamin caught both of his targets for 44 yards and a touchdown in the 33-30 win over the Steelers on Sunday. He also carried the ball for a yard. Benjamin caught all three of his targets for 47 yards in the win Sunday over the Cardinals. Analysis: Benjamin had played in 50 total offensive snaps the previous three weeks combined but saw 44 on Sunday as a direct result of Tyrell Williams' quadriceps injury, which nearly kept him off the field entirely despite him being cleared for the contest. The speedy receiver simply doesn't receive enough looks currently to be a consistent fantasy option, but Benjamin would stand to benefit greatly if Keenan Allen, Tyrell Williams or Mike Williams were to miss substantial time. Benjamin did not record a catch during the 23-22 loss to the Broncos on Sunday. Analysis: Benjamin did see three targets, but the 29-year-old was unable to corral any of them. It's difficult to suggest Benjamin should be used in fantasy format at this point, as he's caught or carried the ball six times in six games this season. Benjamin took a carry for minus-two yards in the 20-6 win over the Raiders on Sunday. Analysis: Benjamin has played in just 31 offensive snaps over the past two weeks as the speedy receiver has largely been used as a decoy in the passing game. A potentially difficult matchup against the Broncos next week won't make Benjamin an attractive fantasy option any time soon. Benjamin lost two yards on a carry and was unable to haul in his lone target during Sunday's 25-17 win over Seattle. Analysis: Benjamin has been hobbled for much of the season with a foot issue and it looks as if the Chargers offense has passed him by. After five targets in Week 1, he has just three total targets in his three outings since. He has a favorable matchup Sunday against an Oakland defense ranked in the bottom 10 of the league at 263 passing yards per game, but he's unlikely to get the targets necessary to take advantage of it. Benjamin caught his lone target for 13 yards in Sunday's 20-19 win over the Titans. Benjamin (foot) is active for Sunday's game against the Titans in London. Benjamin (foot), who is listed as questionable for Sunday's game against the Titans in London, is expected to play, Adam Schefter of ESPN reports. Analysis: Benjamin has played just two of the Chargers' first six games and currently sits fourth on the wideout depth chart. If Benjamin is in fact cleared to suit up this weekend, he may not be in store for a major role behind the club's top three receivers (Keenan Allen, Tyrell Williams and Mike Williams). Benjamin (foot) is listed as questionable for Sunday's game against the Titans in London, Eric D. Williams of ESPN.com reports. Analysis: Inactive for four of the past five games, Benjamin seemingly has a shot to return Sunday after managing limited practice participation throughout the week. He may come down to a game-time decision ahead of Sunday's 9:30 a.m. EDT kickoff, likely filling a role as the Chargers' top punt returner and No. 4 wide receiver if he's able to play. Benjamin (foot) was a limited participant in Thursday's practice. Analysis: Benjamin has been inactive for four of the Chargers' last five games, so he may need to turn in a full session Friday for the team to feel optimistic about his chances of playing Sunday against the Titans in London. Even if he's cleared to suit up in Week 7, Benjamin will likely draw fewer snaps than fellow wideouts Keenan Allen, Tyrell Williams and Mike Williams, thereby capping his fantasy upside. Benjamin (foot) practiced Wednesday in a limited fashion. Analysis: Benjamin's presence on the field for the Chargers' first practice of the week gives him a good shot at playing against the Titans in London on Sunday, but he would likely be an afterthought in a crowded receiver room in such a scenario. Keenan Allen, Tyrell Williams and Mike Williams all rank ahead of Benjamin on the depth chart. Benjamin (foot) is officially ruled out for Sunday's game against the Browns. Analysis: ESPN's Eric D. Williams previously suggested that the earliest the wideout might return is Week 8, so for now we'll consider Benjamin week-to-week versus day-to-day. In his continued absence, Keenan Allen, Mike Williams and Tyrell Williams will head the Chargers' receiving corps. Benjamin (foot) is expected to miss at least one more game, Eric D. Williams of ESPN.com reports. Benjamin (foot) has been ruled out for Sunday's game against the Raiders. Analysis: Per Jeff Miller of the Los Angeles Times, Benjamin is sporting a cast on his right foot and could miss additional time beyond Week 5. With Benjamin out of the mix, Mike Williams and Tyrell Williams should handle nearly all the snaps alongside Keenan Allen in three-wideout formations. Benjamin (foot) is reportedly expected to miss two-to-three weeks, Ian Rapoport of NFL Network reports. Analysis: Official confirmation of Benjamin's out status should arrive Friday, but the report notes that the wideout is sporting a cast on his foot, which supports the notion that he'll miss some time. In his anticipated absence, Keenan Allen, Mike Williams and Tyrell Williams will head the Chargers' receiving corps. Benjamin (foot) didn't practice Wednesday. Analysis: Benjamin's foot woes have limited him to two appearances to date, with the wideout recording two catches for three yards in those contest. He's now looking iffy for Sunday's game against the Raiders after aggravating the injury in the Week 4 win over the 49ers. 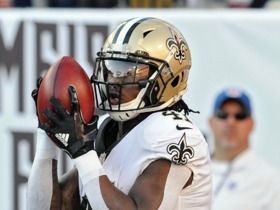 Benjamin exited Sunday's game against the 49ers with a foot injury. Analysis: Benjamin has been dealing with a foot issue of late, so it looks like he probably aggravated his previous injury. Prior to his exit from Sunday's contest, Benjamin turned his only target into a two-yard catch. Benjamin (foot) is listed as active for Sunday's game against the 49ers. 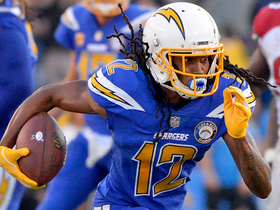 Analysis: Benjamin can stretch the field when healthy, but he'll be a speculative fantasy play in his return to action Sunday, given that the capable trio of Keenan Allen (knee/tooth), Mike Williams and Tyrell Williams remain in the Chargers' wideout mix. Benjamin (foot), who is listed as questionable for Sunday's game against the 49ers, is expected to play, Ian Rapoport of NFL Network reports. Benjamin (foot) is listed as questionable for Sunday's game against the 49ers. Analysis: Much like last week, it appears as if Benjamin will be a game-time call for Sunday's contest after head coach Anthony Lynn sounded less than enthusiastic regarding his status. If Benjamin is held out another week, Mike Williams would once again serve as an intriguing fantasy asset, particularly since Keenan Allen (knee/tooth) could be limited against the injury-riddled 49ers. Benjamin (foot) was limited at practice Wednesday. Analysis: Benjamin also worked in a limited fashion Friday, which offers hope that he'll be able to return to action Sunday against the 49ers. If he suit up in Week 4 after a two-game absence, Benjamin would merely be a speculative option in fantasy lineups with Keenan Allen, Mike Williams and Tyrell Williams ahead of him in the Chargers' wideout mix. It's worth noting that Allen missed practice Wednesday with a knee issue, but it's possible that his absence was maintenance-related. Benjamin (foot) is inactive for Sunday's game against the Rams. Analysis: With Benjamin set to miss his second straight game, the Chargers' Week 3 wideout corps will be headed by Keenan Allen, Mike Williams and Tyrell Williams. Benjamin (foot), who is listed as questionable for Sunday's game against the Rams, is viewed as a "long shot" to play, Ian Rapoport of NFL Network reports. Analysis: Benjamin appears set to miss his second straight game with the right foot injury after he was unable to advance beyond limited practice participation this week. With Benjamin trending toward another inactive status, Tyrell Williams and Mike Williams will be locked in as the clear top complements in the passing game behind lead wideout Keenan Allen. Geremy Davis or J.J. Jones would fill in for Benjamin on the rare occasions the Chargers utilize four-receiver sets. Benjamin (foot) is listed as questionable for Sunday's game against the Rams. Analysis: Benjamin can stretch the field vertically when healthy, but he'll be a speculative fantasy play until he gets a full and productive game in, given that the capable trio of Keenan Allen, Mike Williams and Tyrell Williams remain in the Chargers' wideout mix. Benjamin (foot) did not practice Thursday. Analysis: More on Benjamin's Week 3 status come Friday, but missing practice Thursday after being limited Wednesday isn't the most promising sign regarding the wideout's chances of suiting up Sunday against the Rams. Benjamin (foot) was limited Wednesday's practice. Analysis: When healthy enough to play, Benjamin has the speed to break off the occasional big play, but weekly volume will likely be an issue for him with Keenan Allen, Mike Williams and Tyrell Williams ahead of him on the depth chart. The foot injury ultimately kept Benjamin inactive in Week 2, so he may need to put in a full practice Thursday or Friday to have a good shot at suiting up Sunday against the Rams. Benjamin (foot) is inactive for Sunday's game against the Bills. Benjamin (foot) "is now considered unlikely to play" Sunday against the Bills, Ian Rapoport of NFL Network reports. 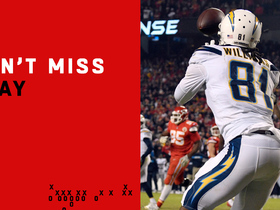 Analysis: If Benjamin does miss the contest, the Chargers will miss his playmaking skills, but they still have a solid trio of wideouts to roll out in Week 2, namely Keenan Allen, Mike Williams and Tyrell Williams. Benjamin (foot), who is listed as questionable for Sunday's contest against the Bills, is expected to be a game-time decision, Adam Schefter of ESPN reports. Benjamin (foot) is listed as questionable for Sunday's game in Buffalo. Analysis: In the aftermath of a Week 1 loss to the Chiefs, Benjamin was wearing a walking boot on his right foot and proceeded to miss every practice this week. Despite the lack of practice reps, the Chargers have given the wide receiver a questionable designation, giving him a glimmer of hope for active status Week 2. In the event he doesn't suit up Sunday, second-year pro Mike Williams should have a substantial role within the offense. Benjamin (foot) will not practice Friday, Eric D. Williams of ESPN.com reports. Analysis: Benjamin has yet to practice this week, which likely puts his availability for Sunday's game in doubt. If the 28-year-old is officially ruled out as expected, Mike Williams (five catches, 81 yards Week 1) stands to gain a fair bit of fantasy value in his absence. Benjamin (foot) missed practice again Thursday. Analysis: Back to-back absences cloud the wideout's availability for Sunday's game against the Bills. If Benjamin is out this weekend, the Chargers will still have a solid trio of wideouts to roll out in Week 2, namely Keenan Allen, Mike Williams and Tyrell Williams. Benjamin didn't practice Wednesday due to a foot injury, Eric D. Williams of ESPN.com reports. Benjamin caught just one of his five targets for a single yard and also carried the ball once for 19 yards in Sunday's 38-28 loss to the Chiefs. 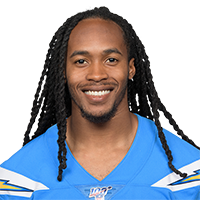 Benjamin has been fielding punts at practice and does not appear to be hampered by an earlier shoulder injury, Ricky Henne of the Chargers' official site reports. Benjamin is dealing with a shoulder injury and may wear a red no-contact jersey at Tuesday's practice, Eric D. Williams of ESPN.com reports. Benjamin is scheduled for a $5.75 million salary in 2018, ESPN.com's Eric D. Williams reports. Benjamin caught four of his five targets for 96 yards and a touchdown in the 30-10 win Sunday over the Raiders. He also carried the ball twice for four yards. Benjamin did not record a catch in Sunday's 14-7 win over the Jets. Analysis: The zero in the reception column wasn't for lack of trying, as the Chargers targeted Benjamin on five separate occasions, only for the pass to be out of reach or simply dropped. A glorified gadget player, the 27-year-old is simply not consistent enough to belong in fantasy lineups at this point in the season. Benjamin recorded one catch for seven yards and also carried the ball once for seven yards in the 30-13 loss to the Chiefs on Saturday. Analysis: Benjamin saw four targets in Saturday's contest but only managed to corral one as the speedy wide receiver failed to capitalize on his limited opportunities. Given Keenan Allen was carted off the field Saturday due to a back injury, Benjamin could see additional opportunities should the star receiver miss more time, particularly in the slot during three-wide receiver sets. Benjamin caught two passes for 21 yards in the 30-13 win over the Redskins on Sunday. 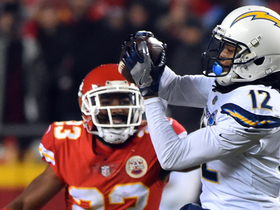 Analysis: It was the "Keenan Allen and Tyrell Williams Show" Sunday, as the top two receivers combined for 243 receiving yards in what quickly developed into a blowout win. Benjamin saw at least three targets for the third straight week, but so long as the Chargers continue to handle their opposition with ease, the speedy wide receiver will likely struggle to see enough opportunities to provide positive returns for fantasy owners. Benjamin snagged four of his six targets for 68 yards in the 19-10 win over the Browns on Sunday. Analysis: Benjamin has quietly put together back-to-back games in which he's caught at least three passes and registered 50 or more receiving yards. Those aren't earth shattering numbers, but with Mike Williams sidelined thanks to a knee injury, Benjamin has certainly filled in admirably as the team's No. 3 wide receiver. The 27-year-old should be in line for another productive week when the Redskins come to Los Angeles on Sunday. Benjamin (abdomen) caught all three of his targets for 50 yards and also carried the ball once for six yards in Thursday's 28-6 win over the Cowboys. Analysis: Benjamin didn't appear to be hindered much by an abdominal strain that limited him in practice during the abbreviated week. Benjamin did most of his damage on one 46-yard reception and given the lack of volume he sees on a weekly basis, the 27-year-old remains merely an option in the deepest of fantasy leagues. Benjamin (abdomen) is listed as active for Thursday's game against the Cowboys. Analysis: As is fellow wideout Mike Williams (knee), giving the Chargers a quartet of capable wideouts in Week 12, with Keenan Allen and Tyrell Williams also in the mix. Benjamin has displayed some play-making ability this season, but he's a hit-or-miss fantasy option Thursday, with no shortage of pass-catching options on hand for QB Philip Rivers. Benjamin (abdomen) is expected to suit up for Thursday's game at Dallas, Adam Schefter of ESPN reports. Analysis: Forced from Sunday's dominating win versus the Bills due to an abdominal strain, Benjamin took part in three consecutive limited practices this week. Even though he's likely available Thursday, he's received exactly one target in three of the last five games, which doesn't inspire confidence in his ability to produce. Benjamin (abdomen) is listed as questionable for Thursday's game against the Cowboys. Analysis: Benjamin's practice participation Wednesday was classified as limited, which also applies to fellow wideout Mike Williams (knee). Benjamin has at times displayed play-making ability for the Chargers this season, but in the team's crowded pass-catching corps, he looks like a hit-or-miss fantasy option in Week 12, assuming both he and Williams suit up. Benjamin (abdomen) was a limited participant in Tuesday's practice session. Analysis: Benjamin registered his second straight limited practice session as the Chargers work through a short week. He isn't thought to be in danger of missing Thursday's Thanksgiving Day game against the Cowboys. Benjamin (abdomen) was listed as limited on the Chargers' estimated injury report Monday. Analysis: After leaving Sunday's win against the Bills with an ab strain, Benjamin displayed some confidence in his health with an appearance Monday, albeit in a limited capacity. On a short week, he may not extend himself beyond such a status as the Chargers prepare for Thursday's game at Dallas. Benjamin was forced out of Sunday's game against the Bills with an abdominal strain. Analysis: Prior to his exit from the contest, Benjamin had recorded just one catch for 21 yards. Meanwhile, fellow wideout Keenan Allen was leading the way among the team's pass-catchers, as the Chargers built up a big lead on the Bills in Week 11. Benjamin did not record a catch on three targets in the 20-17 overtime loss to the Jaguars on Sunday. He also carried the ball once for 13 yards. Analysis: Benjamin's final target was a costly one, as quarterback Philip Rivers tossed up a deep errant duck in the waning moments of overtime, easily falling into the waiting arms of A.J. Bouye and setting up the Jaguars game-winning field goal. It was a disappointing day overall for Benjamin, who followed up an astounding Week 8 performance against the Patriots with an utter dud. He'll look to get back on track against the Bills next week. 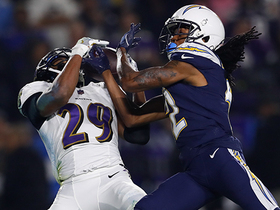 Baltimore Ravens cornerback Marlon Humphrey intercepts Los Angeles Chargers quarterback Philip Rivers to seal a Ravens' win. 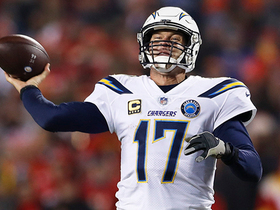 Los Angeles Chargers quarterback Philip Rivers completes a touchdown and two-point conversion pass to wide receiver Mike Williams to beat the Kansas City Chiefs with seconds left on the clock. 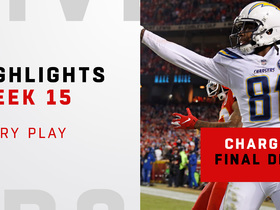 Watch every play from the Los Angeles Chargers' game-winning drive against the Kansas City Chiefs in their Week 15 matchup. Los Angeles Chargers wide receiver Travis Benjamin makes a huge catch between three defenders for a 31-yard gain against the Kansas City Chiefs. Los Angeles Chargers quarterback Philip Rivers passes 26 yards to wide receiver Travis Benjamin to convert on fourth-and-long. Los Angeles Chargers quarterback throws a 1-yard touchdown pass to wide receiver Travis Benjamin. 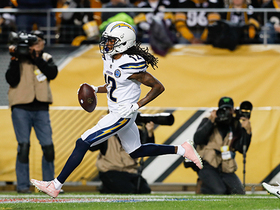 Los Angeles Chargers wide receiver Travis Benjamin sprints across the field to haul in a 46-yard touchdown. Los Angeles Chargers wide receiver Travis Benjamin catches a beautiful sideline dart from quarterback Philip Rivers for a 27-yard gain. Denver Broncos linebacker Von Miller intercepts Los Angeles Chargers quarterback Philip Rivers.